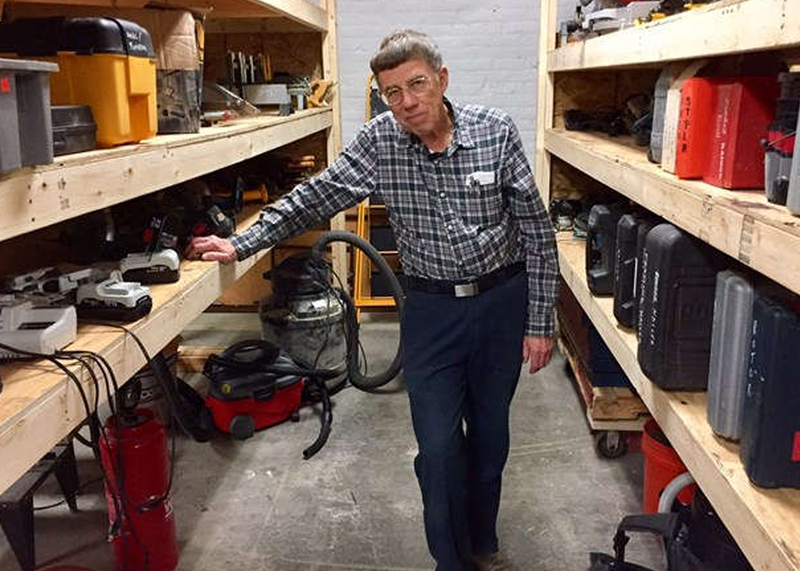 ST. PAUL, Minn. – When the founders of the new St. Paul Tool Library put out a call for tool donations, they didn’t expect their shop floor to be filled by one man. But then, they hadn’t counted on David Merry. When Merry donated his entire massive collection of woodworking tools, the tool library gained, in a single donation, an inventory it thought might take a year to complete. “It was an amazing donation, I’m still flabbergasted,” says Pete Hoh, a member of the library’s local advisory board. But the tool library gained something even better: Merry. Merry’s expertise is valued as he walks between his former table saw, planer, jointer and assorted other power tools, helping the tool library’s less experienced members with their projects. The 78-year-old makes it clear there is no place he’d rather spend time than a place where building is being done. The timing for the donation couldn’t have been better. The tool library was getting ready to open its doors in the old American Can factory on Prior Avenue, at the very time the declining health of Merry’s wife had made necessary the couple’s move to assisted living – where there was no room for his tools. “My parents lost so much in the last year and a half that we really didn’t know how to help him lose this too, so to not have to lose this it means the world,” says Sharon MacFarlane, Merry’s daughter. The tools have extra significance for Merry. He considers them a link to his older brother George, who died of a brain tumor at 21, when Merry was just 15. The Merry boys grew up on a farm in South Dakota, where they built a tool shop together on one side of a chicken coop. Merry says his continued interest in tools was one way he dealt with his brother’s death. “It just meant a lot to me do something with wood and know that George would have done it too,” Merry says. The St. Paul Tool Library opened in March. Members pay a $55 annual membership fee to work in the shop and check out tools. On a recent Tuesday evening, Merry assisted Allie Jones with a small table she was building. Merry is certain his brother George would have approved of the donation. “He would have loved it, I’m sure of that,” he says.